Steep Point, Shark Bay, Western Australia. 5cm long alive. PHOTO: Clay Bryce. 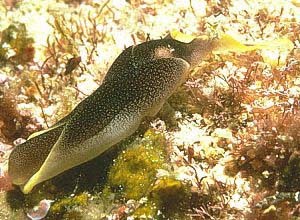 This is a relatively dark form of Chelidonura amoena. The lightest colour form has a background colour of white with the grey-black reticulate pattern restricted to the dorsal surface of the headshield and posterior shield, and to the small sections of the parapodia which fold over the dorsal surface of the body. • Bergh, R. (1905). Die Opsithobranchiata der Siboga-Expidition. Siboga Expiditie, 50: Leiden, E.J. Brill. 248 pp. Re: Are Chelidonura electra and C. amoena the same? Are Chelidonura electra and Chelidonura amoena one species? Chelidonura amoena from Komodo, Indonesia?